N.B. For clarification and/or added information, the wording in italics and square brackets [thus] has been added to the original text by Elmswell History Group. The following is an oral history memories of life in Elmswell of my maternal grandmother, Florence HAYWARD (née CROSS), in about 1910. In that year [when she was Miss Cross] she was the cook at a house in School Road, Elmswell which was then called “Chestnuts” [now known as “Eastbury“] where her future first husband, William HAYWARD, was the gardener. From research, we think that they must have known each other before beginning to work here. Florence told her daughter, my mother (Joy HOWLETT), that a Swiss family lived at “Eastbury”. On the 1911 census the occupants of this house were a widow, born locally, and her two adult daughters, both of whom were born in Switzerland. It is reassuring to know that oral family histories can be verified. It would seem that Florence and William’s employment there was not of a long duration. Her employers discovered that there was a romantic relationship between them and so, as were the normal employment rules at that time, they were both immediately dismissed – we do not know how their relationship was discovered! William found them employment in Clacton-on-Sea in 1911, in separate establishments, of course, as William’s father was the much-respected sextant at Walsham le Willows church. A year later they returned to Walsham and were married in 1912. Florence’s future mother-in-law insisted that she parade up and down Walsham High Street to show the village gossips that she was NOT pregnant. In her diaries and book* entitled “Looking Back at Suffolk, 1900-1983”, my husband’s Great Aunt, Emily LEVERIDGE (née STEARN) left me many memories of Elmswell where she lived from 1900 for about six years, before the family moved to Gt Ashfield, although Emily remained at Elmswell school until 1911. Extracts (specifically mentioning Elmswell) from “LOOKING BACK AT SUFFOLK, 1900-1983” by Emily Leveridge (née Stearn) – by kind permission of her great-niece, Pearl Rose. I was born at the turn of the century in a small village called Elmswell. My mother was 42 years old when I was born, and I was the youngest of nine children. My father [Thomas STEARN] was a yardman, and we lived in a cottage on the farm where he worked. He was paid 11 shillings a week on a Friday night – half a sovereign and a shilling. Ten shillings had to keep us, and the extra shilling was his pocket money. As he liked his beer, this money didn’t last long. Beer cost 2d a pint, but my father used to play the accordion and so was in great demand. 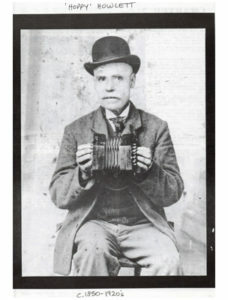 If he hadn’t a penny, he would take his accordion into the Railway Tavern pub and was always popular with his playing and singing. [Sadly, Thomas Stearn, does not feature in the book “Many a Good Horseman” by John Howson, but Pearl Rose’s paternal great-grandfather does – namely ‘Hoppy’ HOWLETT, who was grandfather to George, driver of the Spong Lane steam train on the Elmswell spur line to Woolpit Brick Works. See below a photo of ‘Hoppy’ Howlett, with an extract from that book, which is “a survey of traditional music-making in Mid-Suffolk” – ISBN 01.872301.029, published by Musical Traditions at 98 Ashingdon Rd, Rochford, Essex SS4 1RE. This book (with its accompanying CD of music) is available for sale at Stowmarket Tourist Information Centre, or Elmswell History Group has two copies which can be borrowed, on request.]. My mother worked at a nearby laundry for 2s 6d a week – long hours for so little. We were very poor, but I had a happy childhood. I started school when I was 3½ years old. As my mother had to work all day, my sister, who was five years older than me, took me to school. She left school at the age of 13 and went into domestic service, as we all did at that age. I have five sisters and three brothers. One brother went into the army, another became an engine driver, and one died at the age of 11 months – long before I was born. Our Christmases were very happy. We never had a Christmas tree, but we had a line across a room which consisted of a rope made with ivy, holly or any green leaves. We put this up weeks before Christmas, and we used to save half-pennies and farthings to buy ‘Christmas fancies’. Christmas Day itself was a family day, everyone tried to get home for at least a few hours, and everyone did their own thing. My father would play and each one sang a song. We played Blind-man’s Buff and various other games, then the strip of coca-matting was rolled back for dancing. As I was the youngest of the family, I was made a great fuss of, and as a result was always crying for my mother. I used to wear a red hat and got nicknamed ’Red Top’. Our dinners were very scanty. I have known the time when all we had was swedes, but through it all we survived. I used to suffer agonies at school over my father’s drinking. Beer was very strong in those days and he would get drunk very quickly. I think I have been in every pub in Elmswell to get him home, and I used to listen outside the door for his singing. I would go from one pub to another until I heard him, then I would march straight in and say “Come on, Father!” and he would always come for me saying, “All right, my little Red Top”. The kids at school used to taunt me about this, but he never altered. This was the time of candles and oil lamps. On cold nights we would take a hot brick to bed with us wrapped in a piece of flannel. My mother used to bake in the brick oven, which was heated with bush faggots, and our bread tasted delicious. The grocer’s shop in Elmswell was kept by a Mrs Lomax. Sugar was weighed loose, also tea, and cheese was cut with a wire. In fact, everything that I can remember was sold loose. A farthing would buy a bag of sweets, and I often wished that I could afford one. This reminds me of a day when, on the way to school, I was looking at the display in the shop window which contained every kind of boiled sweet costing ½d each. One day, I walked along to school saying “please God, let me find a ½d.” The Rector was taking his usual Scripture lesson as I walked into Elmswell Church School. He continued asking questions after I’d sat down [Emily was a little late to school that day] and said “Why is it wrong to ask God to find money?” A boy put up his hand and said “because someone must have lost the money in the first place”. I was so scared and felt sure that God knew that I’d asked for money! My parents then moved from Elmswell’s Grove Lane [previously known as Lawton Lane] to Great Ashfield, but I would not change schools. So I walked the three miles there and back each day, although sometimes I would get a lift. It was the day of the horse and cart, and wagons of all kinds would trundle along. The men who worked on the nearby farms all knew me and my mother, working in the laundry, would see my red hat perched on top of the carts, and would know that I was getting a ride to school. I used to dawdle to school, but I was allowed to be late as I lived so far away. First I used to stop at what was called the ‘Bat Factory’ [later Tate & Lyle’s and then Pease Transport], which was a huge wood factory where I used to stand and watch the huge tree trunks being manoeuvred into place until they were sliced. Then I would move on to the blacksmith’s shop where I would peer over the door and watch him shoeing the horses. Then on to Elmswell Railway Station where, if the gates were closed, it would mean that a train was coming, and I would stand and watch this, envying the people riding in them. I remember the foundation stone of Elmswell Bacon Factory being laid  by the Marchioness of Bristol, and I stood among the crowd watching, although I should really have been at school. Empire Day was a most important one at Elmswell School. We walked to church with the teacher, all wearing either flowers or ribbon rosettes in red, white, and blue. After the service we always had a half-day’s holiday. Our school holidays were rather short at Easter and Whitsun, but we made up for this with the very long harvest holiday. Easter always meant new clothes for church on Easter Sunday, and I remember my grown-up sisters having most elaborate hats with ribbons and flowers around the brim.. Elections were great events when I was a small child. My father was a staunch Liberal (yellow) and, as Elmswell was nearly all blue (Tory), I suffered in silence at school, as all the children knew that my father was a Yellow. The Women’s Suffragette Movement was very much talked about and also laughed about. The village policeman was always around to help keep law and order, and the Attendance Officer was also to be feared and would visit school periodically to check the registers. We had very little by way of recreation in those days. A village concert was a great event; occasionally there would be a dance, and sometimes the farmers gave dinners which were followed by [games of] whist or bridge. Working people, however, generally retired early to bed, by candlelight. In 1911 we all moved from Great Ashfield to Westhorpe, where my father had a regular job again. We had a lovely little cottage which went with the job and, best of all, my mother no longer had to go to work. The cottage at Westhorpe was a mansion compared with the one at Great Ashfield and, of course, I had to change schools which I hated, but in every other way it was a good move. We had lovely fires and plenty of food. In our new cottage I was very lucky as far as neighbours were concerned. The horseman lived next door to us with his very large family, and I became friendly with them all, at home and at school. Before this I had been treated as an outsider at Elmswell School, as I lived in another village, but now I had many friends. In the summer we went pea picking in the evenings, and the extra money helped to buy clothes. Then in 1912 there was the Titanic disaster. Everyone was talking about it, but it was a happy year for me – my last happy year as a child as I was soon to go into domestic service. During this year of 1912 a friend gave me an old bone-shaker bicycle which I called Percy; it was a man’s bike with very hard tyres. Spring was a beautiful time when I was a child. The meadows were full of long grass and wild flowers. I used to go flower picking every spring-time, and I also used to pick early sorrel leaves as we would eat them between slices of bread and butter like a sandwich. All the different types of [farm] sprays have changed the look of the meadows today. I was the only one at home now, as my sisters were all in domestic service, but I still had to do my share of errands and field work. Harvest time was the same as it had always been, a busy time for everyone. The first harvest I was at was done with scythes. A few years later a machine called a ‘Sailer’ was used – this was the first mechanical cutter I can remember, and it was an ungainly looking machine with big sails which left loose corn behind it. As many as 15 men, including my father, would work in a line across the fields, swinging the scythes in unison, and they used to sing as they worked. My mother and the other wives were allowed so much malt and hops to brew beer for the men during harvest. When the harvest was gathered in, the farmer gave a great feast – The Harvest Horky – which we all loved, and my father was in great demand with his accordion. Talking of harvest time reminds me of the day I took dinner to Sid (our lodger) to a farm in Elmswell. It was in a large covered basket which I stood down while I climbed a ladder, never thinking of the loose pigs. The farmer called “I don’t know what you had in that basket, but the pigs have eaten it all, whatever it was!” It was Sid who bought me the one and only doll I ever possessed, and how I missed him when he and Nell married. He was always full of fun; father would play the accordion and Sid would dance the ‘Sailors Hornpipe’ which was a great favourite with the men in the Elmswell pubs. Before coming to lodge with us, Sid had spent six years in the regular Army and was seven years in the Reserves, so he was able to take a pension, but it also meant that he was among the first to be called up in the First World War. This is what Ray Howlett says about his great-grandfather. ‘Hoppy’ Howlett lived in Woolpit, somewhere near the Bull, but I don’t remember him, of course. My mother says that her mother used to talk about him. Now, my grandfather used to play as well, and his brother. My grandfather’s name was Charles Howlett, which I believe was also Hoppy’s name. My grandfather’s brother was called Ted Howlett, and they used to call him Teddy O’Neill, and I don’t know whether that had to do with the tune they used to play “Peggy O’Neill”. I can’t see any other connection. I remember him playing that tune, and they used to play duets. Now, my grandfather and his brother used to play with Hoppy, their father. I remember my grandfather saying he used to play at balls with his father. They weren’t dances in those days, they were balls. So they’d play as a trio, probably on concertina and two accordions. I also know that my grandfather could also play the drums. I’ve heard him play; he was quite adept at playing, too. I also understand he played the dulcimer. As far as I can tell, Hoppy was virtually a professional musician, as he did nothing else but play music. When I lived at Tostock in the Fifties, there used to be a man went in the pub there called ‘Blazer’ Everitt, and he told me he used to walk there, and they used to busk around Bury St Edmunds on a market day, and Hoppy always said to the people who were throwing the money “A penny for the boy” which was ‘Blazer’ because he was a young boy then. He must have been 80 when he died, which was 10-12 years ago [c.1970?]. So he made sure he had some finance for going round with the hat. More information came from Charles Howlett’s daughter, Mrs E Wright (of Stowmarket), and she had these memories of her grandfather. Yes, ‘Hoppy’ Howlett was my paternal grandfather. Oh, I remember him playing the concertina; any ‘do’ there was in Stowmarket or Bury St Edmunds , he used to walk there, and he’d head the procession playing that. They called him ‘Hoppy’ because he had one leg shorter than the other. I never knew him to work except when the [Woolpit] brickworks was going, where he probably worked as a young man. I remember my father telling me that my grandmother was from a rich family, and my grandfather used to serenade her with his concertina, and they eloped and married. After that, their people wouldn’t have anything to do with them. By the time my father was born, one of the uncles had relented, and left Dad some money. My father could play the accordion, but my brother was better; he carried that on, but he’s dead now. Anything he picked up, he only had to hear a tune once, and he could play it, on anything – accordion, organ, piano, fiddle. His name was George, as was my father; he was named George William – that is the family name. But I remember my grandfather playing; he used to always sit besides the fire with his hard hat on, he was never without it. Then my uncles, my dad’s brothers, they played concertina, too: Dumper and Teddy. Dumper was a case, he was a real character. They were all musical, but only by ear. ‘Hoppy’ died when I was about 11 or 12 [mid-1920’s? ], and I’m 72 now. So that’s 60 years ago, and he was in his seventies then.